I am betting that you are sitting in an office right now! Yes, I can see you in your cubicle with the florescent bulbs burning. Blub blub goes the water cooler. Well, I am sitting in an office and this white walled interior makes me hungry. It doesn't really matter where I am - I am usually hungry. The problem with going to the office or any other workplace for that matter, is there can be a paucity of healthy food options. There are evil VENDING machines with stuff like chocolate Pop Tarts and potato chips. 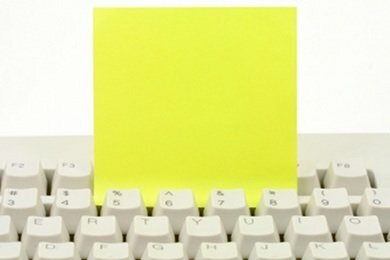 The image above is for you to think about what kind of snack you should write on the Post-It. What if you had a Post-It that said "Apples and Peanut Butter"? Would that help you stay away from the vending machine or the Starbucks Frappucino? Personally, I have difficulty not eating because I get BORED at the office. My afternoon pick-me-up always used to include a sweet treat like a cookie, milkshake, or other confection. I believed I deserved these treats because I was so BORED. Now with 2 children, interesting job, etc., I am not bored and I have managed to switch out my "junk food" snack for something healthier when I get hungry. Below are ten office snacks that don't include the obvious - apples and peanut butter, veggies and dip - and do include packaged snacks that you can toss into your briefcase or purse for snack time. The last three snacks in the list are great recipes for when you have time to make something ahead. You can freeze both of the muffins in baggies so they become a "grab and go" snack. 5. Need Some Intense Dark Twilight Delight? I focussed on packaged snacks for the first seven in the list because most of us are running out the door. Obviously, if you have some fruits or vegetables ready to go - these are preferable to the packaged snacks. What do you take to the office? Please share! Love the idea of making snacks ahead For work! :) I love doing this. I'd also be lost without string cheese for an on the go snack! I love fresh fruit, but it's not always practical to bring to work. I love bringing homemade muffins or bread (this week it's pumpkin bread). I mix a bag of Craisens and almonds. The sweet craisens fix my sweet tooth and the almonds provide protein and healthy fats for satiety. Stress and snacking go together. Work and snacking go together. The worse the job, the more the eating. Thanks for your ideas. for almost 3 years, my department/people on my floor have participated in a veggie/carrot club. everyday, someone is supposed to bring in an assortment of fresh, healthy food (usually veggies and fruit, sometimes chip and crackers with dip) for the participants to snack on throughout the day. today's my day, so I brought carrot sticks, cherry tomatoes, homemade salsa, and some light chips. really encourages healthiness! i also bring an apple and Gnufoods bar for my afternoon snack. I haven't bought anything from the vending machine in years! small bags of microwave popcorn are also good to have on hand if i want to eat a lot of something. I keep a jar of almond butter at work. It has saved me from the vending machine on more than one occasion. I have my lunch and some healthier trail mix - bran cereal, dried fruit, some nuts and some chocolate chips. Yes, I'm sitting in my cubicle right now and counting down the minutes to lunch. I love to bring almonds to work as a pick me up. A few of those go a long way! I pack my food every day which includes a morning and afternoon snack (usually a piece of fruit and a string cheese which I split between the snacks). My rule is: if I didn't pack it I don't eat it. I've lost 72.4 pounds over the last 15 months following this. My favorite on-the-go snack is a Winchester Beef and Berry Bar. For 70 calories I get 6 grams of protein. It's all natural meat with no preservatives, etc. The consistency of the bar is a little different, and my friends either like them or don't. There's no in between. I like getting the extra protein, especially when I'm training for a running event. I love slices of apple with nut butter, sorren malt loaf (usually two slices) its high energy and really yummy. I follow the 80:20 rule so the odd hot chocolate on a friday picks me up, but I also make olive oil crackers and pack guacamole and salsa too !